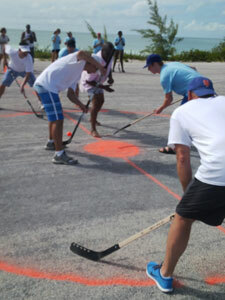 Grand Isle Resort & Spa and The Bahamas shared an unusual world first last week when professional hockey players, decorated Olympians and hotel guests faced off in a road hockey game on the tiny island of Farmer’s Cay. As part of the resort event ‘Sochi Under the Sun’, running February 9 – 23, the group landed on the tiny island to find sticks, nets, hockey pads and a field set up on the air strip. The 60-acre land, with a population of just 27 Bahamians, became the site of a rousing and competitive game just meters from the turquoise ocean. The island’s ten school children also came out to watch the game and even received a few hockey lessons from the professionals. The game VIPs included Canadian Olympic athletes Simon Whitfield, Blythe Hartley, Emilie Heymans and Allain Roy, as well as Zack Smith, Eric Gryba, Cody Eakin and Dennis Polonich, from the National Hockey League (NHL). The spectacle went smoothly despite the occasional aircraft landing on the Farmer’s Cay airstrip, forcing players to yell “plane” and remove the nets. It was a tight and spirited game between Team Blue and Team White going into the third period tied 3-3. Team Blue blew the game wide open with just five minutes left in the game, going up 4-3. They never looked back, and the game ended 5-3. The road hockey game was perhaps the highlight in a number of sporting events at Grand Isle. One day later, the property hosted a “mini-Olympics” on the beach at Emerald Bay. Olympians and NHL players led a series of events throughout the day, such as a 9 a.m. jog, beach volleyball and swimming. 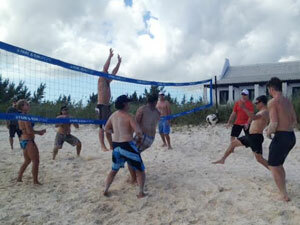 Guests from both Grand Isle and Sandals Emerald Bay participated in the events. Inbetween “mini-Olympic” events, guests watched athletes compete in the Sochi Olympic Games from a live feed beside the pool. Sochi Under the Sun comes to an end on February 22nd when Grand Isle Resort & Spa hosts its Dinner of Champions for the athletes. Deputy Prime Minister of the Bahamas Philip “Brave” Davis, Director of Sports Tim Munnings, and Bahamian gold medalist Ramon Miller are all expected to be in attendance. Located on Emerald Bay in Great Exuma, a magnificent island located in The Bahamas, Grand Isle Resort & Spa is a stunning ocean front villa resort. The exclusive gated community consists of 78 luxuriously appointed 1- to 4-bedroom villas, decorated in color palettes inspired by the sea, lush landscape and tropical ambience. The villas range from 1,250 sq. ft. to 5,200 sq. ft. and offer a fully equipped kitchen, spacious living area, high-end amenities and extraordinary views. Getting around the resort is quick and convenient, and personal golf carts are an option. Complimentary high-speed wireless internet is available. Grand Isle is one of the finest resorts in the Caribbean and the perfect location for a Bahamas Out Islands vacation. Ideally suited for family holidays, romantic getaways, destination weddings and honeymoons, or for simply enjoying the beach, a luxury vacation at Grand Isle is an experience never to be forgotten. Villas are available for sale and rent. For reservations, contact 214-393-2841 (US direct) or reservations@grandisleresort.com. We can book your air and hotel for convenient one-stop travel planning and to ensure you get the best value. For real estate inquiries, be sure to visit our Sales Office Center on property, or contact 242.358.5243 or realestate@grandisleresort.com to reach the Sales Team. Visit www.GrandIsleResort.com for additional information.